The long awaited and often tested Bay Bridge light display went live for real Tuesday night as 25,000 LED lights were turned on on the bridge's western span. "The Bay Lights" is an $8 million privately funded project created by artist Leo Villareal, who said he got the idea at the Burning Man festival. Hundreds, if not thousands of people flocked to the waterfront to see Villareal press a key on his computer to begin the art that stands 500 feet tall and spans 1.8 miles. San Francisco officials say 50 million people will come to the City to see the lights over the next two years. For the next two years, the Bay Bridge will have the Bay Lights. Arturo Santiago reports. The lights will be switched on a dusk every night and will stay on until 2 a.m.
"This piece is incredibly accessible, you don't have to buy a ticket, you don't have to go into a building, it's there and available," Villareal said, calling it a "digital campfire that people can be around and enjoy." San Francisco Mayor Ed Lee said "The Bay Lights" will serve as "a beacon for our arts community" and will complement other large events on the waterfront, including the America's Cup sailing race starting later this year. 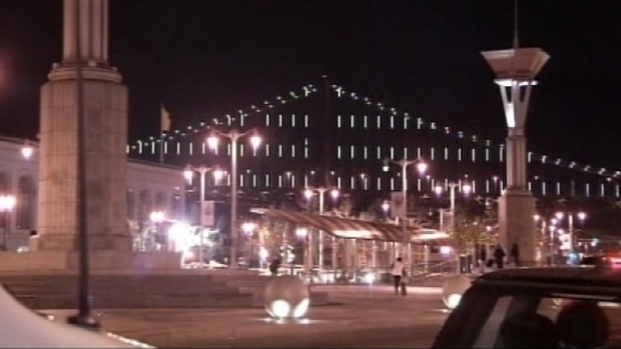 A new art installation has the Bay Bridge in San Francisco outshining even the Golden Gate Bridge. Joe Rosato Jr. explains what sparked the idea to string 25,000 lights on the Bay Bridge. The mayor said he thinks the light sculpture may be so popular that people will want to keep it beyond the two years for which it has permits from state officials. "People, including myself, will want this to be ongoing," he said. Ben Davis, chairman of Illuminate the Arts, the group overseeing the project, said even if the lights remain past the current two-year plan, they would likely have to come down when Caltrans does its repainting and scheduled maintenance of the bridge cables in five years. "It's on a living, working bridge and that bridge needs to be maintained," Davis said. "It's going to have to come down and another solution will have to be found or it will be an ephemeral work like it was designed to be." The project is still seeking about $2 million in funding, which Davis said he was confident will be raised. STORIFY: Photos from around the Twittersphere of "The Bay Lights"
"This is an amazing, forward-moving project that has momentum, and the love is just starting to mount for it," he said. Illuminate the Arts would have to foot the bill for any gap in the funding, he said. As part of the fundraising effort, organizers are offering a "Gift of Light" campaign in which people can name one of the 25,000 lights in honor of a loved one. Davis said the campaign has raised about $70,000 so far. 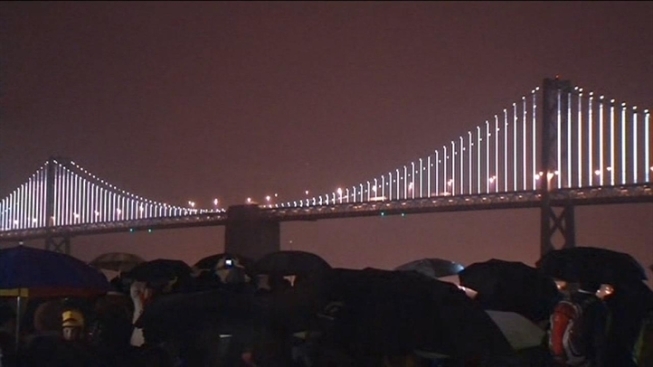 Tonight's lighting ceremony was streamed live on the project's website, www.thebaylights.org, where more than 10,000 people tuned in to see the lights come on in steady rain that began falling in San Francisco only a short time before the 9 p.m. ceremony. Lee and Lt. Gov. Gavin Newsom joined Villareal under umbrellas as the artist turned on the installation to cheers from a crowd at the invitation-only event at a waterfront hotel. People wishing to find out more about the project or to donate can visit www.thebaylights.org.